McEvoy Traditional Blend Extra Virgin Olive Oil...more than just for dipping. McEvoy Olive Oil is estate-grown, certified organic & produced from select Tuscan olive varieties. McEvoy Traditional Blend olive oil is a medium-bodied oil with aromas of fresh olive fruit, newly-mown grass & robust garden greens. McEvoy Traditional Blend oil is emerald at harvest, mellowing to a greenish gold. The flavors are traditionally complex with hints of almond & artichoke with a mild peppery finish, & is a vibrant finishing oil. McEvoy Traditional Blend Olive Oil is pressed from olives grown on the legendary McEvoy Ranch in Marin County, California. McEvoy's olive oil is a blend of six Tuscan olive varietals. This golden to green vibrant olive oil serves as an exceptional complement to any culinary creation. McEvoy of Marin is truly an olive oil lover's oil!!! A pantry must have...McEvoy Ranch Tuscan Olives. 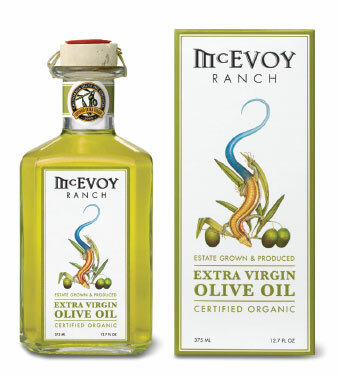 McEvoy Ranch Traditional Blend Extra Virgin Olive Oil. Tuscan Varietals: Frantoio, Leccino, Pendolino, Maurino, Coratina, & Leccio Del Corino. 1800 Trees On 80 Acres.